I remember when I had my first baby, she wouldn’t stop crying in the middle of the night, the first night I brought her home! I remember me and my husband trying to work out why and how to stop our baby crying, were we doing something wrong, was there something we could do to fix it and what did she want? We turned to Google frantically trying to work out what to do to stop her. You see as adult onlookers we associate crying with pain, upset and distress. When in actual fact crying is your babies primary method of communicating with you, as a newborn, they haven’t mastered emotions such as smiling, or how to make eye contact and their way of communicating is through crying. 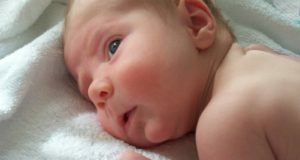 So, firstly we need to look at some of the causes for crying, work out what your baby may be trying to communicate about and see if we can resolve this to stop the crying. Once we are sure we have satisfied all of the main reasons that your baby could be crying about we can look at what soothing tactics we can employ to stop your baby crying. What are the top 6 reasons for my baby crying? When a baby is first born they have a tiny stomach, this needs filling often as once it gets empty they are hungry again. If you are breastfeeding this may become even more frequent as you’re not sure exactly how much milk they have had. It won’t do them any harm to offer your breast to them and let them have more milk. Your breast is also a great natural soother to them and helps comfort them when they are upset. If you are feeding your baby on formula milk you may find that they don’t need feeding as regular, usually, if they drink the whole bottle they will be satisfied for 2 hours. However, some babies like to leave some and almost graze on the milk more frequently. It is down to the individual baby and each is different. So, if you know your baby hasn’t fed in the last two hours and they are on formula then that would be a good starting point if they are crying. If they don’t settle immediately, give them a few minutes and see how they go. Babies love to be held and feel close to you, in the womb they have been used to feeling and hearing your heartbeat for a long time and hearing that again is reassuring and lets them know they are safe. Sometimes all that is required is holding them and gently swaying, I found with mine that gently tapping them on the back whilst doing this in a regular pattern also helped. This again goes back to the regular pattern of the heartbeat that they are used to and feel safe around. 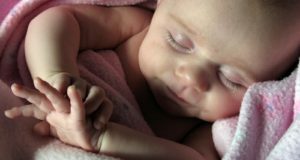 Your baby needs lots of sleep! The issue is that when you first have a baby everyone you know wants to descend on you to visit the new bundle of joy. Whilst this is tiring for you, it is also tiring for the newborn. You will start to notice signs of when your baby is tired, they will show them time and time again when they are ready for a nap. This could be whining for no apparent reason, staring into space or remaining quiet and still. You will get to know your baby yourself and what the signs from your baby are. This is a learning process, you are getting used to your baby, what they want when they want it and how they ask for it. To a stranger, their cry will sound like any other babies cry, but you will get to notice subtle differences in their cry. When they are not well this is a perfect example, their cry is different, almost more urgent and almost trying to express pain or discomfort. Babies pick up bugs just like you and me, they also get upset stomachs easily, but one of the most common reasons can be a new tooth. Up to a week before a new tooth comes through they can have an upset stomach, red cheeks, elevated temperature. With anything with children or babies if you are not sure as to what is wrong seek medical attention immediately. We are very fortunate in the UK as you have NHS direct at the end of the phone, simply call 111 and someone will talk you through the symptoms and offer free advice. An excessively wet nappy or one that they have done a poo in isn’t pleasant for them to have attached to them. Nappies can hold a lot so a small wee shouldn’t affect them, I found as a new parent I was changing nappies far too often. A poo is fairly easy to spot due to the smell or quickly looking down the back of the nappy. What I did like is that some of the nappies like the ones below (click the picture to buy from Amazon) now feature a way of telling if the baby has done a wee without removing the nappy. Tparticularlylularly useful if the baby is sleeping, they have either an indicator that changes or a colour that changes. Regulating a babies temperature is quite simple. As long as they aren’t unwell which you can check with a thermometer. As a rule of thumb give them an additional layer to what you are wearing and this will keep them just fine. At night time for the first few nights, you will be checking their temperature a lot. Make sure you don’t check the temperature of their hands or feet as this can fluctuate a lot and isn’t an accurate guide. Instead, place your hand on their belly, this gives an accurate guide to their temperature. If you find they are too cold add an extra blanket if they are too warm remove one. There was a lot of talk when I had mine about whether in their cot they should have bumpers and blankets or whether or not you should opt for the grow bag style sleeping bags. We opted for the grow bag and we were very happy. These come in different tog ratings depending on what season we are in. I will discuss these in a separate post as I think they are great. Try to keep the temperature of your babies room at around 18 degrees, that is a comfortable temperature for them to sleep at. Some babies cry more than others. Some sleep through right away and others don’t, that’s just the way it goes. You will get to know your baby and what is normal. Peak of crying – Your baby could cry more each week, peaking around month 2 and reducing in months 3-5. Unexpected – Sometimes the crying can come and go without explanation. Resists soothing – Sometimes no matter what you try it doesn’t seem to help. Pain-like face – It may appear they are in pain, when in fact they are not. Long lasting – Crying can last as long as 5 hours a day or more. Evening – It can be that the baby cries more in the afternoon and evening. The important take away from PURPLE Crying, which you can find more about here is that the word period indicates that they cry for a period of time! It does have a beginning and end and it isn’t forever. These things can really put a toll on parents and relationships and if you are struggling with parenting in any way including colic/PURPLE crying it is important to speak to someone. This could be a friend, family member or your GP/Healthcare visitor. So, you have checked that your baby isn’t hungry, has a clean nappy, their temperature is ok and that they are feeling ok. You are either in a situation where they are tired and need soothing and calming so that they fall asleep or they just want soothing to stop them crying. Either way, you need to find what strategy works best for you to help them calm down and stop crying. As I said before I found that whilst gently rocking my baby and tapping at a regular beat on her back really helped her, she liked being close to my chest. Babies like your natural smell and the beat from your heart, all these things help them feel safe and warm. You could be in two different situations at this point in my eyes. The first being rocking them in your arms simply isn’t working, or secondly, that works, but as soon as you put them down awake or asleep the crying starts again. A few years back people were buying CD’s that had various noises on such as hair dryers, vacuum cleaners, white noise, pink noise, etc. To be fair, if you have been in the situation at 3 AM and your baby will not stop crying no matter what and knew that this CD would work, you would likely pay £100 for it! However, thanks to modern technology there are now several apps available either on the Apple App Store or Android Play Store for free that achieve the same. They have a wide range of noises available and you can see which works best for your baby. My little one’s personal favorite was the hair dryer. I would put the app on whilst she was in my arms then I could lie her down with the noise on for the first 10 minutes she was sleeping and it did the trick perfectly. This wasn’t something I had to do every time she was crying or needed settling as I didn’t want her to depend on it. However, I knew I had it in my arsenal should I need it. You can also look on YouTube and find similar things if you don’t have the facility to get the app, all completely free of charge. Please make sure if you do use your mobile phone for either of the above, you don’t put it near the baby as we aren’t fully aware of the damage a mobile phone can do to a baby or child. Also, ensure it isn’t balanced anywhere that could land on the child. A car ride is a great way to ensure your baby goes to sleep. My daughter is 3 now and still goes out like a light after 10 minutes on the motorway. The road noise, smooth surface and moving feeling is all it takes. So if it is practical taking your baby out in the car can be a great way to get them to go off. Again, I would recommend you have this in your arsenal as a tactic you can use when you need to or feel it suits, try not to use any of these tactics too extensively so that the baby becomes dependant on them as you are setting yourself up for an hour drive every night at bedtime otherwise. There are several devices on the market that allow you to rock your baby in them. Sometimes simply putting them in their pram and rocking them back and forth is all it takes. But sometimes this isn’t practical, you might not have the space to push your pram up and down in your house. Or if they need soothing regularly you may have to sooth them whilst doing other household chores. A range of gentle rocking devices are on the market that sooth the baby, some vibrate, move and even have lights and sounds. There is a great range available online for you to choose from. Some are better quality than others and offer different features. I really like the one below (click the image to go to Amazon) this is priced around £160 at the time of writing which is 20% off the RRP. The 4Moms rockaRoo not only rocks your baby and has balls that they can play with, but also allows you to connect an MP3 player to it, be it your phone, iPod, etc to play yours or their favorite music or sounds while they are gently rocked. I have put a short video below so you can see it in action. It also has been designed so that everything is removable so that it can be put in the washing machine. One final feature that I absolutely love is you can control it all from your smartphone should you wish. So without going over to your baby and unsettling them you can slow it down, speed it up or change how it moves. There are so many thoughts on the matter of a dummy I could write an entire blog post on the subject. Some people agree with them and others don’t! Personally, I used one until the age of 1, then I took it off my daughter. I have friends who haven’t used one and had no issues, others have started not using one and then decided to adopt one at a later stage. I don’t think it is a great idea to constantly put a dummy in your babies mouth regardless of need. It isn’t supposed to help their teeth or speech if they are still using one as they get older. Again, like some of my other strategies, I think that used in moderation and something you can have at your disposal when required is never a bad thing. So, if you have no intention of ever using one, buy it and keep it shut away in a draw, then should the time ever come where you require one, at least you have one available. There are other options though, some babies just like something to chew on. This might be at a time when they are bored, all babies put things in their mouth, especially as they start to teeth. This can be toys, your phone or the occasional spider. They are learning and exploring the world, one of their main ways of doing this is through taste and exploration. If you decide that at bedtime you are going to not make use of a dummy that is great, but sometimes when they are crying in the day you could offer them something to either sooth the teething process, or sooth and comfort them. Personally, I like the plastic chews that you can refrigerate to make them nice and cold. So hopefully as you can see there are many reasons why your baby might cry. As your baby gets older, you are with them more you will get to understand their “different” cries and what they mean. I hope I have also given you a good idea of what to check for and what you can do to try and stop the baby crying. As always if you have any questions or input please let me know in the comments below.